The Cabinet has approved to amend the Divi Neguma Act to use the term ‘Samurdhi’ instead of Divi Neguma, Parliamentary Reforms and Mass Media Minister Gayantha Karunatilake said. Addressing the weekly cabinet media briefing yesterday at the Government Information Department the minister said that cabinet approval has been granted to publish the draft Bill for the Amendment of Divineguma Act No 1 of 2013 in the gazette and present it in Parliament, following the proposal made by Social Empowerment and Welfare Minister S.B.Dissanayake. 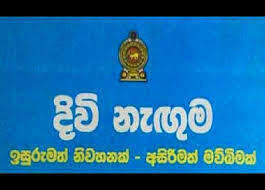 The Minister said that the cabinet of ministers has already approved the amendment of the Divi Neguma Act No 1 of 2013 following the request made by rural level officers who coordinate programmes related to improvement of living standards of low income communities, to use the term ‘Samurdhi’ instead of ‘Divineguma’. Responding to a question raised by a journalist as to why the government has decided to change the name Divi Neguma to Samurdhi,the Minister said that it is more convenient for the rural level communities and the officers who coordinate this programme to use the term Samurdhi since they used the term Samurdhi from the beginning after it was introduced by Minister S.B.Dissanayake.